One of our passions in recent years has been to find a way to become more organized with all of our various projects so that we can relax when we actually stop working. Because let’s face, we’ve all got more things coming at us than we can handle! 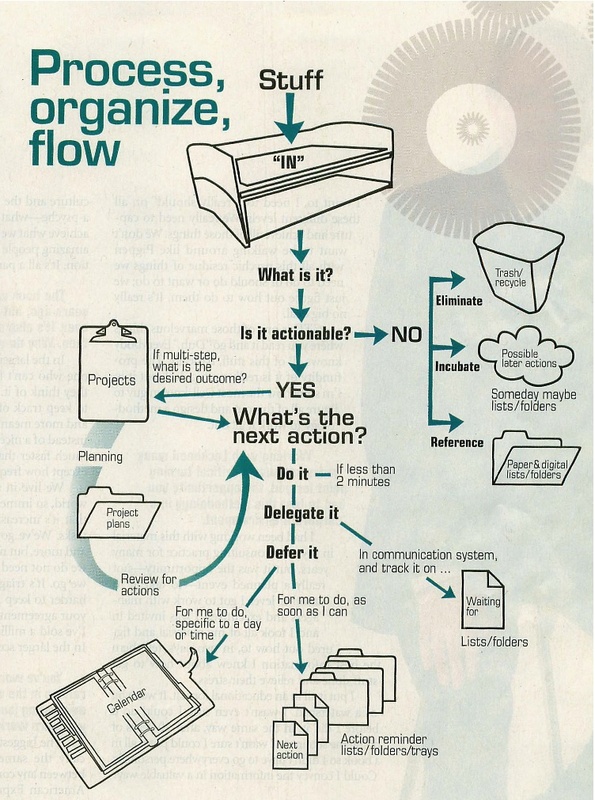 Brett read about a method (and book) called Getting Things Done (GTD) from many tech bloggers. I bought David Allen’s Getting Things Done book a number of years ago and read it. I changed the way I was doing many things, including completely redoing all of my file cabinets (making them all alpha and no more hanging folder groupings). Brett and I went on a lengthy search for the best online tool or software program that would help us to track all of our todos and next actions. We selected RemembertheMilk.com (RTM), although in truth, I am the only one who still uses it. Brett doesn’t really enjoy spending time planning. So I do most of it, and we work his to-dos into the list. Another thing we did that really helped was buy a Dymo Laser Labelmaker (actual model name: Dymo Labelwriter 400 Turbo); it’s a bit of an investment but I love it! Lastly, we also bought a Fujitsu ScanSnap S510M, which makes scanning documents into PDFs easy! With these tools, you just have to take the time to process your projects and determine the next actions to move each project along. But the cool thing is that this system still works if you want to just make piles. You just have to process the information in your life. I wanted to share this chart from the Costco Connection magazaine because it really makes the process clear in a user-friendly way.